I studied perspective in college drawing class but didn’t completely understand it, didn’t like it, and thought I had little use for it. Years later my friend Barbara gave me a copy of Drawing on the Right Side of the Brain. 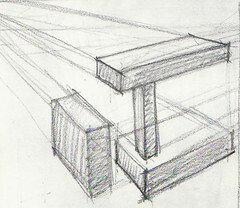 In that wonderful book, the author offers a more “right-brained” way to work with perspective, using a variety of strategies that allow one to see angles and shapes without having to use more “left-brained” techniques like 2-point perspective. It gave me what I needed to draw well enough to get by, and I came to appreciate my slightly wonky style of drawing. It worked just fine for free-spirited sketches or paintings. When I needed something to be drawn accurately (as the basis for a realistic watercolor, for example), I would either grid it up, trace the enlarged photo onto watercolor paper, or draw/erase/draw/erase first on tracing paper until I got it right and then trace that onto watercolor paper. But plein air painting, which I’ve become passionate about, requires a quick accurate drawing in order to start and finish a painting within 2-3 hours max. After that time the light changes so much that colors, shadows, and anything moving (clouds, creatures, water) are completely different. Starting with a bad drawing dooms the painting right from the start. I needed to go back to basics and get a grip on perspective. 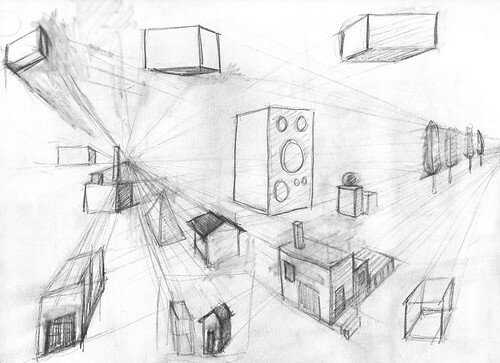 I grabbed Keys to Drawing by Bert Dodson, read the section on perspective and started sketching stacked up childrens blocks, stuff in my house, and from my imagination, trying to understand perspective. Here’s something I didn’t know before: The horizon is always at your eye level. The horizon line (e.g. where the sky meets the land or the sea) is actually what you see when looking straight ahead at your eye level, whether you’re sitting, standing, or lying on the ground. I find that really amazing — it just seems so self-centered, somehow. A few things still confused me so I did some more research on the web and found two helpful sites with good information. How to Draw and Paint, offers a couple of basic, easy to understand articles about perspective. Ralph Larmann’s Art Studio Chalkboard from the University of Evansville goes into more technical detail and provided answers to the things that were confusing me (like what happens when the object straddles the horizon, or the object is at an angle, like peaked roofs, or the ground is hilly). I’m going to do some more practicing using what I’ve printed out from those two sites. I also picked up an excellent book from the library: Perspective Drawing by Kenneth Auvil, which is actually fun and interesting reading. Any other suggestions for improving linear perspective drawing would be gratefully accepted. Thanks for the links to drawing info. 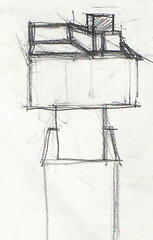 I think angles are hugely important in helping to create a successful drawing. When drawing the figure I always look for the angles. The major angles of the head, arms, torso and the smaller angles such as the wing of the nose or the various planes of the lips or eyes. Thanks for the reminder that the human body follows the same rules of perspective, and is really a series of blocks, and cylinders connected together by little spheres (sort of). Great post, so informative, thanks! Great observations! I, too, struggle with perspective and correct angles. It’s difficult – and I admire your perseverance. Thanks for sharing what you learned. AKKKKK PERSPECTIVE!! YIKES…. MY NEMISIS TOO .. BUT I SO APPRECIATE YOUR POSTING THESE AND YOUR CHALLENGES TOO — MINE AS WELL!!! THANKS FOR THE LINKS …. I’VE GOTTEN TO THE POINT OF ‘JUST GUESSING’ AND SEEMING TO COME ‘CLOSER’ THAN WITH A RULER — BUT MERCY, SUCH A CHALLENGE! Ruler?! 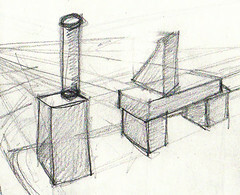 Nah, just my pencil….no math, but an understanding of the logic and vanishing points does seem to help me. Girl, you’ve got “grit”!!! For perspective, I just do the following: don’t draw buildings, or boxes, or city scenes, LOL. Actually, anyone who draws or paints would benefit from doing what you’re doing. I think more often than not, though, we rely on the one-eyed-stick-the-brush-out to match angles technique. Thanks for posting this. I have save a couple of links to websites which are of great help and easy to understand. I have always been fascinated by difficult perspectives and admire works which seem to master the play with them. These are great links! Thanks so much. I especially like the Evansville one. Perspective Without Pain…..I’ve had that book for years and learned so much from it, but alas…it is PAINFUL! This is a great post and very informative…thanks! PS: Happy Valentines’ day!! and thank goodness hearts are soft and round and perspecitve doesn’t matter…well, maybe in matters of the heart? I’ll look for that book. I love the title! And you’re so right about soft hearts! 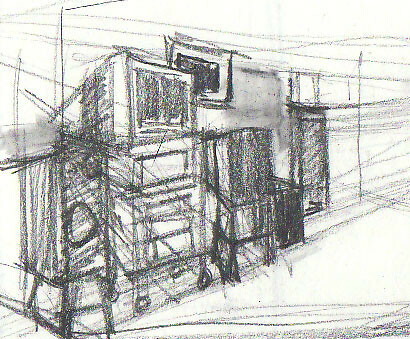 I’ve found using a viewfinder works wonders for speeding up perspective drawings on location. Make the hole the same format as your working surface and you then have edges and right angles to site the lines of whatever you are looking at – I don’t do much requiring it but I’m always amazed at the difference when I do use one. I think it also makes the theory visual and thus easier to grasp. That’s a terrific suggestion. I do have a plastic viewfinder that can be adjusted to standard sizes and I hadn’t thought to use it to compare angles. I’ve mainly used it to compose a scene and also since it’s medium gray, to check values. Ugh! Perspective and such like drawing brings back painful memories of one subject in the art course I did yonks go and I think I got a border-line pass. We were laughing about those years recently at a reunion of art students and talked about this gangling old man boring us (well, anyone over 30 was very old to us then) with technical drawing is what I remember. I usually had a snooze in his classes. Oh that first image does look familiar! I took a course in perspective too … for me, it’s something that looks so easy and is oh so difficult. I was constantly being told that I didn’t know where the edge of the table was and so on. But, perspective is a very important aspect of art. Thanks for your posts on this subject! 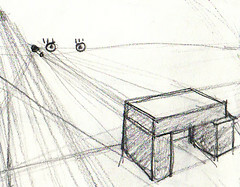 Jana, Perspective is such a powerful tool in image making,. It is great that your are delving into it. If you don’t already have the book, I would recommend one by Andrew Loomis on figure drawing that has some very good illustrations of the figure in perspective. The drawing where he demonstrates how the viewer’s eye level cuts through figures at relatively the same location on their anatomy, regardless of their distance from the viewer is very effective at getting the point across. Carlson’s book also has a whole chapter on perspective in nature, with some very clear cut examples and descriptions. He even talks about perspective in trees! You comment about eye level always being tied to the horizon, applies in a general sense, but many common exceptions to this ‘rule’ occur when you look up or down to such a degree, that the horizon is no longer in your picture. It doesn’t mean your eye level has vanished, it is just that you don’t have a convenient point of reference for it. If you’re on a hill, looking down into a valley, you’re eye level is probably not the horizon either, even if buildings are receding towards it! Imagine you are in a crashing plane, heading towards the ground, you might notice that the interior of the plane is oriented towards the ground, not the horizon. I may be coining my own definition, but, to me, Your eye level is not just your elevation above the ground plane, but is tied to your point of view…. where you are looking.